The GMMES has its roots in a club formed in 1953, called the Thames Group Model Marine Society. As the name implies it was at that time a wholly marine society, meeting in different rooms in the Gravesend area. As time passed the interests of the club widened to take in different aspects of model engineering. 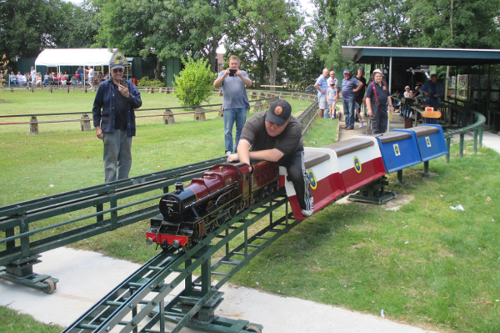 There developed an interest is miniature steam and a locomotive and portable track were built, which the club could run at fêtes and other local events in the Gravesend area. This helped in promoting the club and raised much needed funds. In 1977 after much searching the society was to find its home on the present site. With the money raised from the portable track runs and a loan from the local Council, thoughts turned to planning the first permanent track. The Sergeant Major of the Royal Engineers Plant Training School at Chattendean Barracks at Wainscott in Strood, (in his own words) "had a dozer and sapper dispatched to carry out the earth works". Meanwhile members were busy constructing the track sections and supports. Most of this work was carried out in the garden of one of the members. When finished these 20ft. sections were carried to the site for erection. Eventually in April 1979 an oval track 600ft. in length was officially opened by the Mayor of Gravesend. Over the years the track has been lengthened and improved. The first change being to lengthen the straight sides by 60ft. This necessitated producing a deep cutting for one section, which at its deepest point, conveniently gave the club an excuse to build a short tunnel. The second major change to the track came with the introduction of the inner section of sharper curves giving the layout seen today. In 1994 the society was honoured to host the 26th 'International Model Locomotive Efficiency Competition' (IMLEC). Mr. Martin Evans attended to present the prizes and it was agreed by all, that the two days of the competition had been a great success. Year 2000 saw the society hosting the Southern Federation Spring Rally. With so many visitors bringing their locomotives, running lasted all day and well into the evening. The day was rounded off nicely with a barbecue everyone having had a very enjoyable day. In 2003 we celebrated our 50th anniversary with an event during which visitors from many clubs joined us for 2 scorching days. One of our aims was to display 50 of our own members loco's; this we achieved comfortably. During the second afternoon, the Mayor of Gravesham, Councillor Smith and the lady Mayoress arrived and after being greeted by members of the committee were given a tour. The Mayor was particularly interested in some of the items on display in the exhibition tent. With the tour complete, the couple boarded a special Mayoral train pulled by a Merchant Navy class and driven by our club Chairman. They enjoyed the first lap of the track and set off for a second. Unfortunately unbeknown to the driver someone had closed the feed-water bypass valve before starting off and the boiler overfilled with the inevitable result. The only damage was to the driver's pride and nobody got too wet; the Mayor and Mrs Smith were quite amused by the whole thing. The Mayor then unveiling the special commemorative plaque that will eventually have pride of place in our proposed new club building. The proposed new club building became a reality in February 2004. The site was prepared and eight concrete foundation pads built to accept the ready-made steel building. It was driven on the back of an articulated lorry all the way from the manufacturer in Ireland. A hired crane lifted it from the lorry and placed it gently onto the pads. All that remained was to connect the water and electricity supply and the building was usable. Being made of steel and with shutters over the windows it was hoped this would afford better security than the old wooden hut, but the single most important feature provided by the new building would be the toilet! With no main drainage on the site, the toilet was not yet serviceable, so a cesspit had to be installed. A hole four metres deep and 3½ metres in diameter was dug and a 6000 litre “flask” installed, the work being carried out to the relevant regulations. The new building and its facilities has been a great success, the extra security it provides has made the investment well worth while. A very worthwhile improvement erected in 2015, was a roof for the steaming bays. This is very much appreciated when the weather turns wet and is just as valuable for those hot sunny days, providing much needed shelter from the sun. Also, 2015 saw the completion of a roll-on-roll-off system for passenger trolleys and locos. This was in the planning for well over three years and is at last functional. Now instead having to lift the trolleys onto and off of the track as we used to do, they are stored on their wheels on track mounted in three vertical tiers inside a large container. 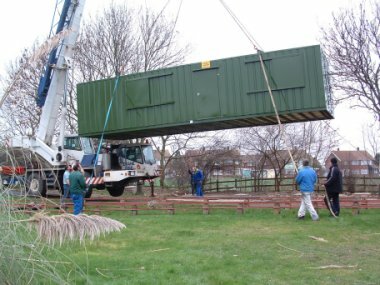 When they are needed on the track, they can be wheeled, from the container via a moveable section of track, to a siding where they can be coupled with a waiting loco. To get the train onto the main running track, it negotiates a point system. First, an 18 feet long hinged section of the main track is pivoted to one side. Then a curved hinged section at the end of the siding is swung in to join the open end of the running track and locked. The waiting train can then just steam onto the running track. After this, the curved section is then swung back, the straight section of the running track swung back into place and locked. This has made a huge difference as trains can now be transferred onto and off of the running track quicker and with far less effort than previously. The Society currently has approximately 80 members of all ages and from all walks of life. Members interests range from garden gauge railways to 5" gauge and larger; from steam rollers and stationary steam engines to hotair engines. Alas, there are now only a very small number of members within the society active in marine modelling. Potential new members are always welcome at our meetings and at the club track on Sunday afternoons (April to October). Official society business is discussed at our meetings held at 8:00pm on the fourth Saturday of each month at our club building in the grounds of the Cascades Leisure Centre, Thong Lane, Gravesend. The construction of our track consists of mild steel fabricated rail sections, supported at interval on concrete 'A' frames. 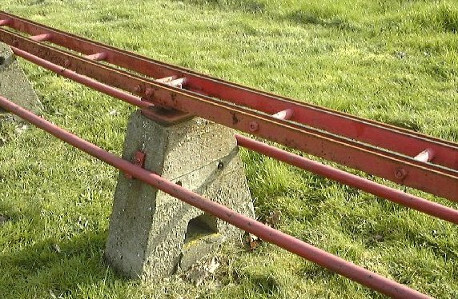 The 'A' frames also serve as supports for a continuous anti-tip rail. Being dual gauge and as all riding trolleys are of 5in. gauge. Both 3½" & 5" tracks are placed equally about the track centre line, ensuring that the locomotive is in line with the driving trolley regardless of the gauge of the loco. The photograph should make this clearer. In total our track 1218 feet (371 metres) in length. The layout is such that it fits comfortably within the limits of the site and is made more interesting for passengers waiting for rides as they are able to watch trains passing in both directions on three sections of track directly in front of the station. We have also installed a boiler water treatment plant and pump the treated water to the station and steaming bays.